TV Line Recap: Yep, Felicity Is Pregnant — But Who Found Out First? TV Fanatic recap - It's time for Diggle and Lyla to get a different storyline. I so didn't care about pretty much any plot point in the entire episode. This is going to be such a long, slow slog through the back half of the season. I'm not looking forward to it at all. I was, however, upset that Felicity didn't put a bullet in Diaz, and even though we saw him go up in flames, there was no body and we've supposedly seen him "die" in prison before. Yes, I'm really, really hoping this will be the end of him, but it wouldn't surprise me to see him pop up again. Adrian Paul is looking really good these days--much better than he was a while back. Good for him. I have no interest in Dante as a villain or as a threat, because this show has done a really poor job of showing us why he deserves to be thought of as such a major villain, and even him visiting Emiko didn't help matters. Oh, and I really wanted Emiko to laugh in Oliver's face when he was spouting off about his parents teaching him the importance of family. Really, Oliver? You'd say that to the half sister your father was ashamed of and that you've never met? Classy. I too would like to believe that's the (finally) the last we'll see of Diaz. I'd like to believe that, but I don't yet. Dante just seems like Diaz 2.0 though; another bad guy who is Very Bad and a Very Serious Threat for poorly-defined reasons except that everyone keeps telling us how Very Bad he is and like Diaz his chief power seems to be the ability to bribe/coerce/extort anyone and everyone into working for him. The whole Felicity nightmare in the beginning and my feeling about Felicity's whole pregnancy storyline in general is that a line I read somewhere recently just kept echoing through my head: "...the kind of storyline that men write for women." I have no idea what the male/female split in the Arrow writers' room is but I really hope they can avoid having "pregnancy storyline" just totally swallow up Felicity as a character. I'm not optimistic though, because Laurel 2 became inexplicably sweet, caring, feminine and full of heartfelt advice the minute the pregnancy storyline called for it, all her previous characterization be damned. I think Diaz is dead. Laurel was there when he killed someone by burning them alive and she has now returned the favor. Agreed with Dante being poorly defined. His working with Emiko to get to Oliver is an interesting twist, though. Oh yeah, Laurel is a pretty good suspect for Diaz' murder. Although she would also be the first to be questioned. I don't know how else I would've done the pregnancy stuff, but it was kind of necessary if they already revealed Mia in the future. And they can't hold it off for too long since William isn't super older than Mia. I agree that Laurel 2 did a whiplash of personality change, but she was also warming up Felicity this season. 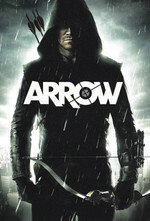 Probably to the surprise of no one, Arrow will come to an end after a ten-episode season next year. Does anyone else think that the Rubik's cube tape is the answering machine tape from William's grandparent's phone and that when he finally listens to it he will learn that Oliver and Felicity truly did love him? "An uneven episode reminds us how much we connect with Arrow's heroes and how little we care about the villains"
I'm going to be relieved when Arrow finally ends. I pretty much watch it for Felicity and to keep up enough for the crossovers. Otherwise it is not fun most of the time. I am curious as to how they're going to deal with this 20-years-later flashforward plot and wrap it up that quickly though. I dread having to slog through a pregnancy storyline and baby storylines on an action show. Sigh. Can we just pull a little Parks and Rec time jump on that bit? Still want Diaz dead and gone, he probably still won't be dead and gone. Grandparents are so blocking those calls.